Has anyone ever done a family portrait with the family dressed in construction worker clothes? I like a lot of these family portrait ideas, but I just though of this one too. What would be the best location to do a pose like that? Please give me your feedback on this idea. Join in and write your own page! It's easy to do. How? 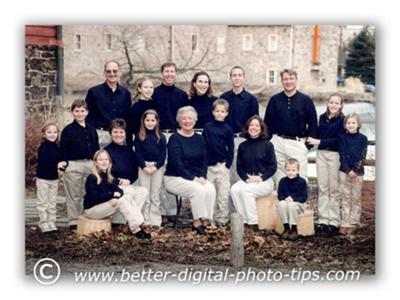 Simply click here to return to Family Portrait Ideas. If you're lucky enough to have snow in your area, pose the family making a snowman or around the family having fun sledding. Just make sure you can see everybody's face in the pose. Use a tripod and a self-timer or get a friend to push the shutter button. I guess having a family portrait taken in cold weather makes for a COOL pose, Ha Ha. Sorry I couldn't resist. One of the ideas for doing cold weather photography is for the photographer to set up the pose as best as possible in his mind's eye first. Have the camera angle, background and lighting figured a head of time. This will allow your subjects to stay warm in a building or in their cars when you are shooting a family portrait in chilly weather. Noses and cheeks turn red quickly, especially on young children in cold weather. Another tip is to try to shoot when there is little or no wind. It was a long time ago, about 1975. Digital Photography was not around. My kids were less than 5 years old. We decide to take pictures at our local farm market. My wife was a fashion consultant, so she came up with the idea for the portrait clothing. We dressed in jeans and brown shirts and posed our family portrait on top of a small pile of pumpkins. The sun was setting and we were washed with reddish light from the glowing sun. The idea was to get the kids in a good mood by letting them climb on tops of the pumpkins. One of the workers came over to us and yelled at us not to climb on the pumpkin pile. Somehow my wife charmed him and got him to take the picture of our family using my Minolta XD-11 camera. It is one of my favorite photos. I will try to get my daughter to scan it and I'll upload it so you can see it. It is one my favorite photos of all time. 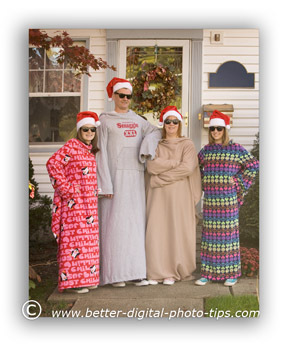 This year's photography portrait idea was to dress up in "Snuggies" for the holiday pose. These kept the subjects warm too in this outside photograph taken in mid November. It was easy to get good expressions in this family pose because of the sunglasses. Santa hats added to the fun, holiday spirit. The tallest subject was placed in the middle and the shorter subjects were placed on the sides with the colorful, patterned "Snuggies" placed on the outside. One of my clients always comes up with creative family portrait ideas. She had seen this fun idea for a family portrait. We discussed it during our portrait consultation well before the day for the photography. I chose a location that would have good portrait lighting because we were going to some more traditional family portrait poses as well. We did poses of the family and just the two girls in two different spots, as well as with the family dog. The front steps of the clients home were perfect for the feet pose. It was late afternoon, so the sun was behind the house and my subjects were first posed in the front yard, using the open shade lighting from the sky. After the traditional posing we proceeded to the creative feet pose. I posed them with mom and dad in the middle to create that hump-backed pose or "pyramid pose", using just their feet and brightly colored socks and shoes. My family was giggling during this pose and I ended up shooting some photographs with all of their bodies showing as well. Everyone had fun, which always makes a great environment to get naturally happy expressions. I like it. I like it. Great idea. 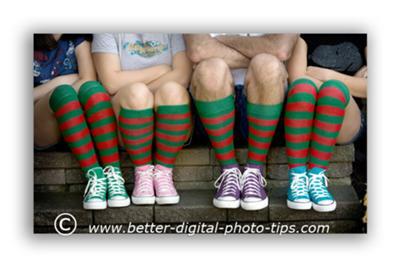 You might try this family portrait idea with bare feet too. An old college buddy of mine contacted me about photographing him, his mom, his sisters and all of the family members. It was in January and a bit chilly, but the kids were old enough to tolerate a little bit of cold for the sake of the family portrait. He and his sisters had come up with this portrait idea. We met at an historical dam in Maryland. I found this spot with the historical buildings behind my subjects for the background. We talked about the best portrait clothing to wear ahead of time and it was perfect for this portrait session. Everyone was thrilled that they were able to get together and schedule this portrait that they will treasure for years to come. It was a bit cloudy so I used a little fill flash to lighten up the shadows from the dull, overhead lighting. We had a photographer come to our home and take family portraits of my husband and me with our 3 daughters. My husband was reluctant at first with the idea of a family portrait pose in pajamas, but when we saw the proofs he knew it was a good idea after all. Now we have a large wall portrait displayed in our bedroom and we still enjoy it to this day. p.s. I love your site. It has a lot of good photography tips. We always do a beach vacation photo of our family and we wear navy shirts and khaki pants. It's been a family tradition and we like the idea of doing the same place each year, then we can compare how the kids change from year to year. Beach portraits are always a good idea. It's important to shoot the photos at the right time of day too. You get a nice warm glow right at and just after sunset. Do some family poses with the sun behind your family and use fill flash if unnecessary. Then shoot the portrait with the sinking sun just below the horizon with the sun lighting up your subject with the reddish or orange color. Thinking about family portraits ideas was not on our mind when we planned our family vacation. We had planned a cross country trip by car from the east coast, westward across the country, visiting as much as we could in two weeks once the kids got out of school in June. Our trip included Devil's Tower in Wyoming, Badlands and Mount Rushmore of South Dakota, Old Faithful and Yellowstone, and Zion National Park in Utah. It was an amazing trip, the five of us packed in a minivan, and of course many photography opportunities for a great family portrait. Three teenagers, camping equipment, food, my Canon DSLR, but of course no Portrait Clothing. 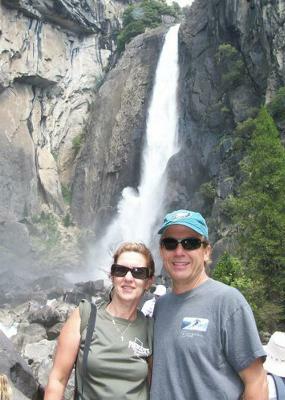 One of our most memorable hikes during our vacation was in Zion national Park, certainly a nature photographer's dream. That's where the idea came up to do a family portrait. We set the camera on a mini-tripod on a sturdy rock and used the self-timer camera setting. I did a good job of picking a great background, but we were dressed like a family on vacation and not dressed for a portrait. Still it was one of our favorite portraits because of the memories it brings back of our amazing vacation. I read this somewhere and thought it would be another good family portrait idea to use water in your family photo. What I mean by this is using water as the background for your portrait such as a lake, a stream, the ocean, a waterfall. Pose your family at a nearby park that has a water fountain in the background. You could also create a "wall of water" with one of those garden sprinklers that shoots the water upward. Family portraits that have backgrounds that are natural looking don't look as posed as an in-studio portrait; even though you may arrange your subjects in specific spots in your photo's composition. Read the other articles on this photography web site, relating to group, family and individual posing tips. Make sure it's a fun experience learning new digital photo tips and techniques.